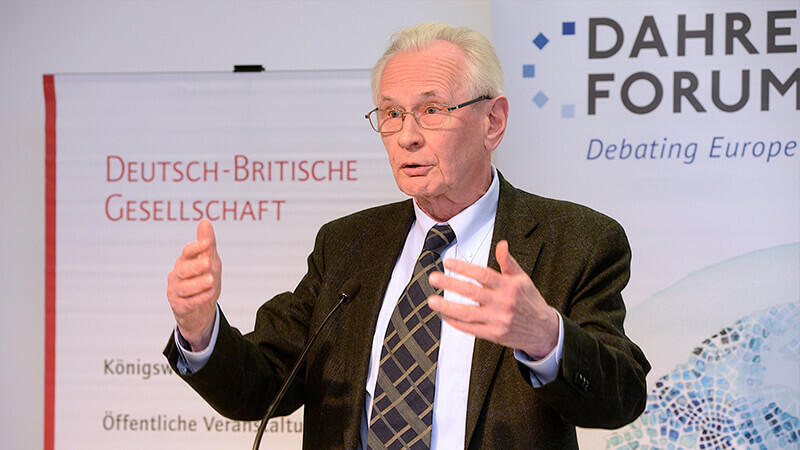 Dieter Grimm outlines its sources and remedies in a talk at the Hertie School. 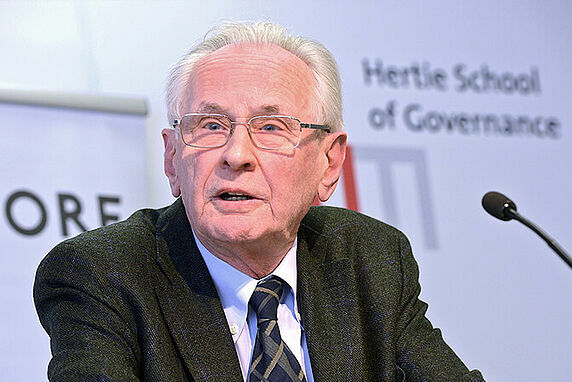 Legal scholar and former German Constitutional Court judge, Dieter Grimm, diagnosed the source of the European Union’s current “legitimacy deficit” and offered some solutions for moving beyond the current crisis in a talk on 7 February at the Hertie School of Governance. Grimm traced the historical origins of this Achilles heel, beginning with two seminal EU Court of Justice decisions in the 1960s, to the signing of the Maastricht Treaty that laid the basis for the EU, the failure of European integrationists to recognise waning public support, and consequently, Great Britain’s decision to leave the union. “Under the cloak of economic integration, changes took place that went far beyond a common market,” Grimm said. These did not become the subject of political debate, but their consequences unfolded over time. Grimm sees the Treaty of Maastricht in 1992 as a turning point for the high level of support the EU had until then largely taken for granted. In terms of integration it was a “step forward”, but in terms of acceptance among the population, “it was a step backward,” he said. As nationalist voices began to rise in the European Parliament, the EU sought a constitutional treaty in 2003. The idea was to have “more Europe,” but it turned out that this objective was not shared by all: “The constitution failed precisely in those countries where it was submitted to a referendum,” Grimm said. One reason was a disconnect between citizens and their representatives in the European Parliament, which is built into the legislative system, Grimm said. Electorates vote for national parties, but their Europeanisation in the form of faction-building occurs only after elections. This means national parties run on programmes that may not even be represented in parliament. Nevertheless, Grimm said he doubts that Europeanising elections alone would solve the legitimacy problem. The decisive flaw is the “growing autonomy of the EU’s executive and judicial organs” from democratic processes in the EU and at the national level. Grimm outlined several events that have led to this. For one, the shift from unanimity in favour of qualified majority voting in the EU Council helped smoothe political processes, but has meant member states are now subject to laws they may not have approved. But the most far-reaching consequence arose from two European Court of Justice judgements in 1963 and 1964, Grimm said. Judging European law to be directly applicable in the member states, the court paved the way for European law to take precedence over national law – including national constitutional law. “From that moment on, the European Court of Justice could take integration into its own hands. The member states were no longer needed,” Grimm said. Grimm argues that “over-constitutionalisation” of the EU treaties prevents states from resisting this trend. Constitutions usually regulate how political decisions are produced, but leave those decisions to institutions, which make policies based on electoral preferences. But the by far greatest part of the treaties is comprised of norms that are not of constitutional nature, and would usually fall under “ordinary law” in the member states. Thus, “decisions of an enormous political impact come about through administrative and judicial channels – through non-political mechanisms and hence outside the democratic process,” Grimm said. The only way to change this is to amend the treaties, which is very difficult. Some have suggested that the EU’s legitimacy deficit could be solved by reforms that would strengthen the power of the European Parliament and place it at the centre of the EU. But Grimm does not believe this would be a panacea, as the EU would then be even more dependent on its own, internal legitimacy derived from the parliamentary election. “Put simply: the EU cannot do without the legitimacy that emanates from the member states,” he said. Grimm proffered several solutions to the current crisis. First, “internal legitimation” must be restored. The European Parliament elections must be brought closer to the public through a Europeanisation that would allow national interests to be balanced before the election, rather than after. Next, safeguards are needed for the “creeping erosion” of member states’ powers. Communalisation must be limited and there should be a division of powers in the legislative branch according to subject matters, like in every federal polity. Finally, the treaties should be reduced to a clearly constitutional nature, in order to “repoliticise” decision-making, which has been eroded by the growing autonomy of the judiciary and executive in democratic processes. This would require limiting the treaties to provisions on the goals of the EU, the powers of its institutions and their procedures and rights. All other provisions would be removed and relegated to ordinary law. While politically difficult, this solution is legally easy, Grimm asserted. Dieter Grimm’s book on the subject, Europa ja - aber welches? 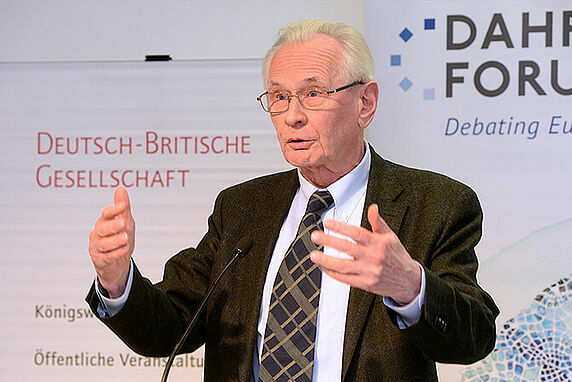 : Zur Verfassung der europäischen Demokratie (C.H Beck) was published in 2016.